There are several home remedies for head lice that work safely and effectively to kill lice that my doctor recommended when we were dealing with lice in our home. As you may recall, in the previous part of this series, when discussing the pros and cons of treating head lice with homemade or commercial products my personal vote fell on the side of using a home remedy head lice treatment. If you want to use one for your kids, or yourself, in case of a head lice infestation, here are some good ones to try, that are both safe and effective. All the effective and safe homemade head lice treatments work in one of two ways, by either heating the lice or their eggs to kill them, or by suffocating them. For the head lice in your child's hair you really cannot use heat to kill them, because you will hurt or burn your child's scalp in the process. Therefore, besides the hair dryer treatment I suggested when discussing head lice nits, those remedies using heat will be discussed in the next part of this series, about the equipment needed to treat head lice around your home, such as on clothing, bedding, carpet, etc. Today's focus is on killing the head lice in your child's hair, and the way to do that is to suffocate the lice. Lice, like other living animals, need air to breathe. To kill the moving lice in your child's hair take away their ability to breathe for long enough and you go from head lice to dead lice. Therefore, all the effective homemade treatments for head lice involve some type of thick, viscous liquid that you place on your child's hair and scalp and let sit there for 8-10 hours, covered with a shower cap. 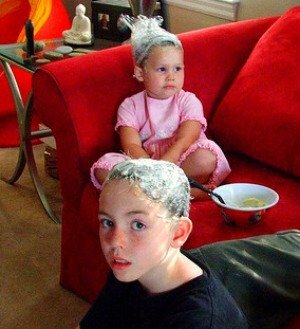 If you don't have a shower cap you can easily get a cheap one at the store for a dollar or so, or you can just make your own with some plastic wrap to cover their hair and scalp (obviously not their face, otherwise you will suffocate your child too). Just because 8-10 hours is a long time to have a shower cap on your head we chose to let my daughter wear it overnight, so the time would seem to pass faster as she slept. 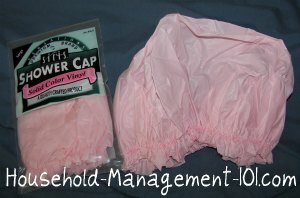 However, if you have very young kids that will pull and poke at their cap you may want to have them wear it during the day so you can keep an eye on them. Use your best judgment. Although my doctor's office did not specifically suggest it I have often heard the suggestion to use olive oil to treat head lice, including in a couple of head lice books I have read. This makes sense, and I believe it would also work because it is quite thick and would also be effective in suffocating the head lice. For whichever product you choose to place on your child's hair apply it liberally onto dry hair and then immediately place a shower cap over it. Then, let it sit for at least 8-10 hours before removing the cap and rinsing out the product in the hair. Depending on what you have chosen you may either need to just rinse it out with water, or also use shampoo to remove the grease and oil from the product from your child's hair. We ended up choosing to use the dishwashing liquid to kill the lice in my daughter's hair, and it did work. I asked the doctor's office if it needed to be Palmolive and they said no, but the dishwashing liquid had to be quite thick, and many other brands just weren't thick enough to properly do the job, so we just went with what was suggested. I chose this because I figured it would be the easiest thing to rinse out of my daughter's hair, and it was. It took a lot of rinsing because we used a lot of soap, but eventually it all came out. Therefore, if this occurs again I would not hesitate to use one of the above home remedies for head lice, but probably would choose a different one next time. Use common sense when considering any homemade product to kill head lice, especially for anything that you apply onto your child's hair and scalp. For instance, an old remedy suggested for killing head lice is to douse your hair with kerosene. This is not a good suggestion, because kerosene is highly flammable. You run the risk of causing severe burns to your child just to kill bugs. Not worth it in the slightest. Especially with safe effective home remedies for head lice out there, do not do anything stupid just because you are panicking about head lice. Always stop and use your common sense before trying anything so you do not make the problem worse, or cause unexpected complications or injuries. In the next part of this series I am going to be discussing additional steps you need to take for your child's hair, and also around the house, to get rid of head lice infestations completely. Please understand that one step alone, such as these home remedies, will not stop an infestation if you also don't take all the other steps too. Yes, you will kill the lice currently in your child's hair, but you will allow a reinfestation if you don't also deal with the head lice nits in their hair, and kill any head lice lingering in other areas of your home, like in bedding, clothing, brushes, the carpeting, etc. Further, even if you are very vigilant it is possible you will get a reinfestation. These creatures are very small, and difficult to eradicate. Therefore, if you see live lice in your child's hair again, most likely 7-10 days after the initial treatment most likely some nits hatched that you missed. If this happens you need to start your whole head lice treatment process again, including using one of these safe home remedies for head lice to kill those newly hatched lice. The idea is to catch the infestation earlier the second time, before the newly hatched lice mature and are able to breed. Stop their life cycle and you will stop the infestation.